Two things. I love Mexican food and I love chocolate. Who would think to mix them together and make an awesome dish? Well someone did! This dish has a spicy yet very light spicy taste to it. 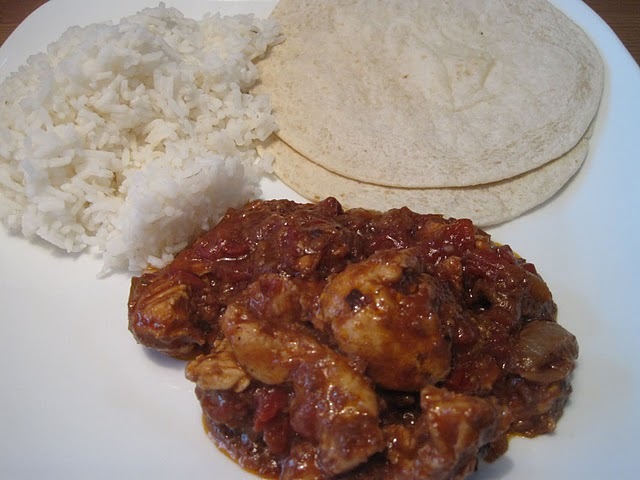 It’s the perfect change to enchildia’s.I served this with a side of white rice and some tortillas! Perfect to wrap together! In a pan over medium high heat, combine the oil, garlic, cocoa powder, cinnamon, red pepper flakes, and black pepper. Saute for 2 minutes. Add tomatoes, broth, salt and bread and bring to a simmer. Add the chicken and return to a simmer. Cover the pan and cook for 12 to 15 minutes or until the chicken is cooked through. Adapted from Womans Day, from Rick Bayless. I apologize up front for the picture, I totally forgot my camera in another room and so opted for the I-phone camera! But this is yummy! Pretty quick to put together as well and pretty reasonable calorie wise, about 400 calories per serving.This makes two servings. Heat oven to 375 degrees. Coat two ramekins with non stick cooking spray. In a medium saucepan, combine couscous, 1 cup of water and some of the salt. Bring to a boil and cover reducing to medium low, cook till couscous is cooked only about 5 minutes or so. Stir in asparagus and set aside. Melt butter in saucepan, add garlic till browned a bit. Whisk wine and lemon juice together in a separate bowl, add to saucepan and cook about 2 minutes, stir in shrimp. Sprinkle some salt and pepper on the shrimp. 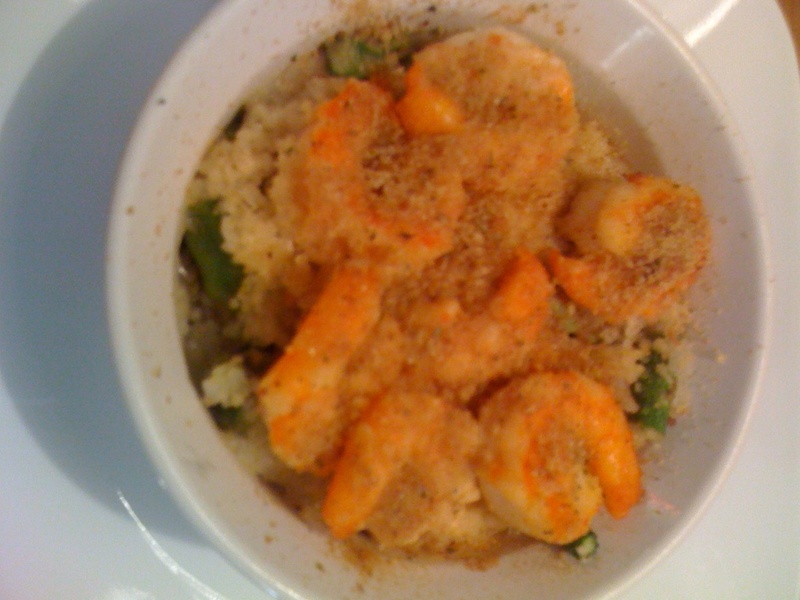 Divide the couscous mixture among the two ramekins, top with shrimp mixture. Sprinkle each dish with 1/2 tablespoon of the bread crumbs and spray with non stick cooking spray. Bake for about 15-20 minutes till shrimp is cooked through. We love spiral hams in our house. We don’t have them very often though. But my in-laws gave us two small hams and we froze them. I decided it was time to take one out and make it! I decided that I would make a recipe that from the recipe book the folks at Holland House had sent me. 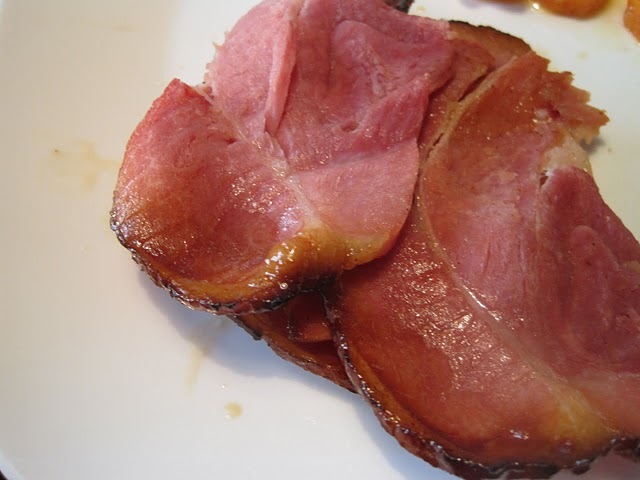 Spiral hams have a great taste to them to begin with but adding a glaze them makes them so much more delicious. Not to mention the leftovers are awesome! In a small bowl, combine glaze ingredients, set aside. Score top of ham in a criss cross pattern. Place ham in shallow roasting pan. Bake at 325 for about 30 minutes or until fully heated, brushing with glaze throughout baking. We love pasta in our house. We could eat pasta with every meal if we tried. But we can’t. So once a week, we try to at least have one pasta meal. 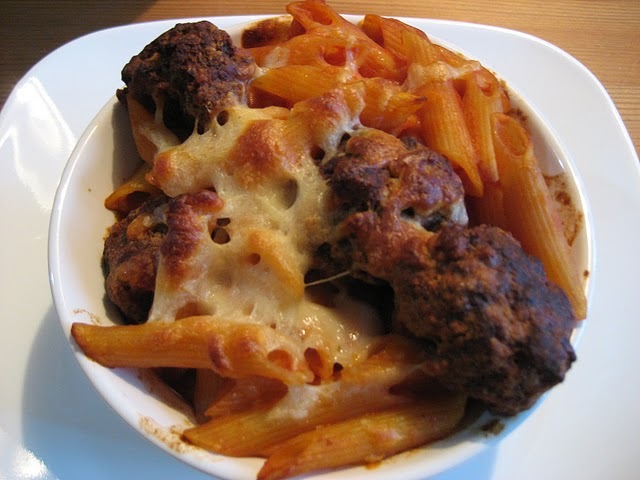 This weeks meal was Baked Penne with Meatballs. This dish reminded me of Baked Ziti, but just a different noodle and a bit healthier with less cheese! Even Puggie liked the few pieces of penne she had. This particular recipe made 3 servings. In a large bowl, combine meat with spices and bread crumbs. Shape into 12 meatballs. Transfer meatballs to a foil lined baking sheet. Bake for 15 minutes at 400 degrees, turning once. Meanwhile, cook pasta according to box directions. Coat three ramekins or a baking pan with non stick spray. Add pasta, toss with meatballs, tomato sauce and 1/2 cup of the cheese, divided evenly among ramekins or put in baking dish. Bake for 25 minutes at 400 degrees. 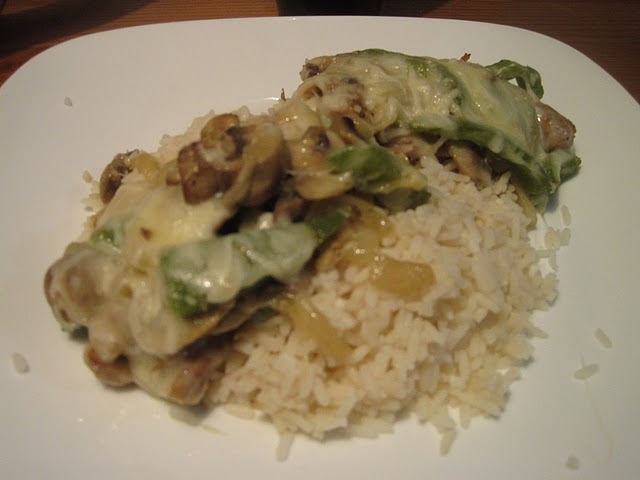 Top with reaming cheese and serve. I was doing some blog browsing and came across the blog Sing For Your Supper. 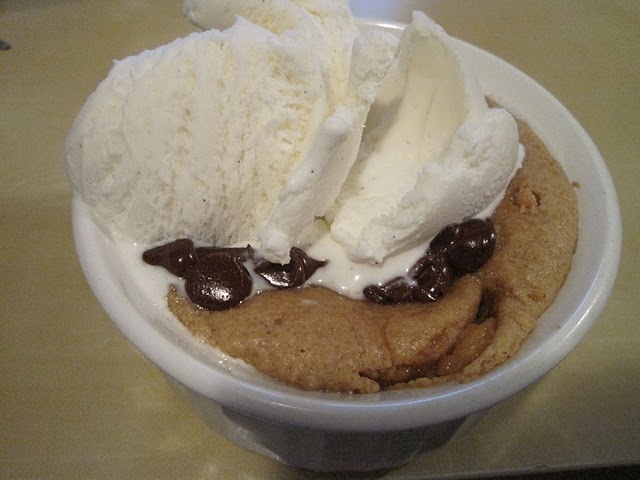 The picture she posted of the dessert she made my mouth water! I knew I had to make it ASAP! She had made Peanut Butter Chocolate Chip Cookie Cups. It’s such a simple easy dessert make and you won’t feel bad after you get done eating it, because it’s just SO yummy! Pre-heat oven to 350 degrees. Spray two ramekins with non stick cooking spray. Fill a ramekins with as much peanut butter cookie dough as you would like, save the extra to make another night. Bake for 10-12 minutes, I baked only for about 10 minutes because the husband and I both like cookies to be a bit gooey. As soon as they are done baking top with some chocolate chips. Top that with some vanilla ice cream. Recently(ok so really like 3 months ago) I saw this post on Nutmeg Nanny’s Blog. My mouth started to water, because smothered chicken is SO delicious, but so bad for you! So when I saw that she had lightened up the recipe, I knew I had to make it. This is SO delicious. I don’t need that 1,000 calorie smothered chicken dish anymore. Heat half of olive oil in a skillet and add peppers, mushrooms and onions. Saute until soft and then add garlic, oregano, salt and pepper. Stir together and set aside. Heat remaining olive oil and add chicken thighs, cook for about twenty minutes, cooked all the way through. In a 8×8 pan and chicken, and top with veggie mix, top with chicken, place cheese on top of chicken and bake until cheese is melted.